So, I'm wondering why Software Defined Security didn't take off the way the SDx of most everything else did. Was on a call recently with one of the big analyst organizations. When asking a very specific question about Software Defined Security, it became very apparent that any of the promises of circa 2014 should be forgotten. Which got me to thinking why. I took the next 15 min at my whiteboard and came up with this. It's not all inclusive, it's just what I could come up with quickly. Mobile Device Management isn't working out so great when it places itself above the user experience. I'm just going to come out and say, it didn't work. Then, looking at the variety of combinations of "layers of security" applied to secure an application delivery, simplicity is simply out the door. Some of these (identified in red), require a specialist. Automation, while possible, covers the aspect or profile of the security control mechanism. Putting an automation wrapper around all of it, well that's just gruesome. The best methods available today are layered automation by mechanism with some of these still requiring zero-touch provisioning capability. With where and how these different security functions need to be applied, scaleability needs to be in relationship to something. What can you choose as the focus when these functions all apply at different levels and locations? Flexibility pretty much follows scaleability. Cost effectiveness. Now, if you apply the cost of maintenance of devices, operating systems, security applications, application delivery frameworks, people, programmers and the application itself. This just doesn't look like it is going to be easy to optimize. The final item really requires the attack surface reduction to absolute minimums. We're running new applications, on new and old software, on new and old operating systems, with new (and old) flaws and exposures. Increased Security has to be in relationship to something, like the absolute elimination of attack points in the application delivery. Easy enough to do if you don't want the application to work, not so easy when there are zero day exploits announced all the time. Exploits that take advantage of possibilities not even envisioned when the software was designed for any of the devices or software relationships in the path. The contention here is that the application delivery model has to change before Software Defined Security can holistically assume the advantages applied to other constructs of the SDx model. Simon Wardley http://blog.gardeviance.org keeps posting maps, exercises of maps and guidelines for maps. Maps, maps, maps. As he @swardley recently followed me on twitter @abusedbits, I suddenly developed an immense sense of trust and responsibility to have a look at his teachings. What I was hoping for was a simplified method to create a level of prediction about what could be expected in 2016 based on where they were from my PoV in 2015. 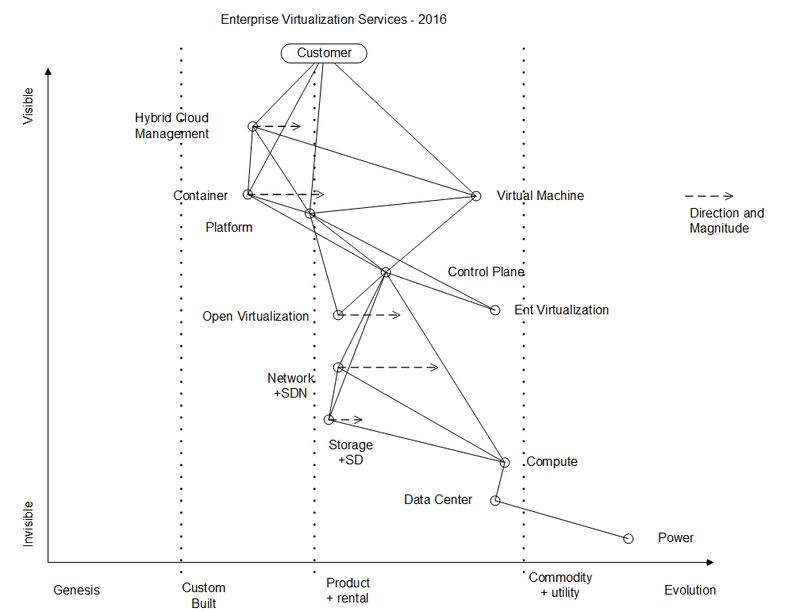 As position is relative, the map is comprised of elements of Enterprise Virtualization. These are connected where natural connections exist and placed to the best of my ability. I then made a decision to create a direction and magnitude vector, also being relative, but as a predictor for how those elements would advance on the map. 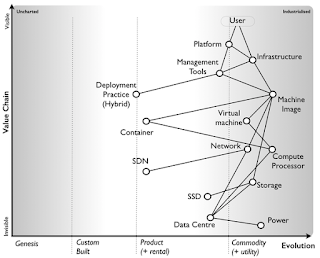 Network of the legacy variety is getting more complex the more virtualization is applied. So, up and to the left it is. Opposing this direction, Network using SDN should get less complex as SDN functions are developed to be used with the control plane, so to the right. Certainly not downward as it still has some level of visibility to the user. Storage is similar to Network. Traditional Storage will be a lot less fun to deal with at any higher densities than it is today, with a direction up and left. 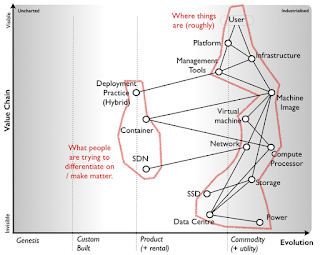 Software Defined Storage will start replace traditional storage methods so, to the right. In both cases, when the Software Defined capability completely outpaces the traditional, a wholesale shift to the +SD feature set should take place. 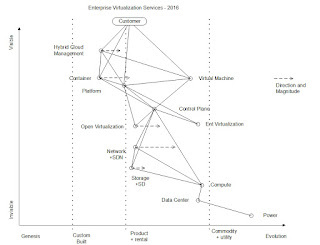 Open virtualization in the enterprise still needs some nurturing. It should slide right on the map as users get more familiar with it. 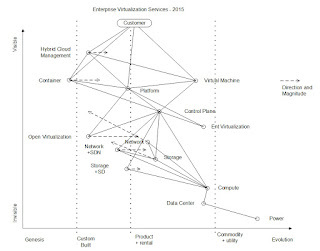 It probably won't outpace more traditional virtualization methods, so only into the enterprise product space. I also realize there are vendors with it is a product, but have a difficulty justifying it in the product space by what I've seen to date. 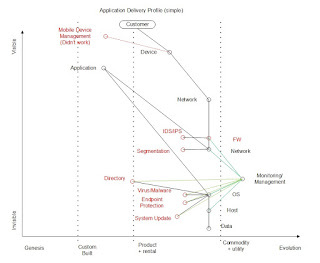 Platform ecosystems are tenuously on the border of products. They still require a substantial amount of care and feeding. I'm parking them for now. Container technology should be one of the big movers. 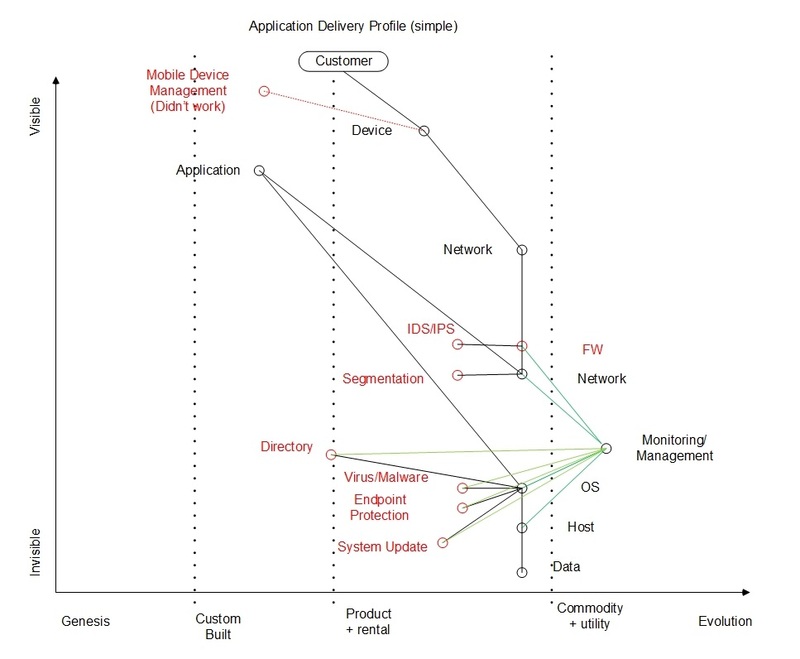 Enterprise adoption is masked by the reliance on 2nd platform application types, but should be a clear win for any enterprise that makes the jump to 3rd platform, so, to the right. 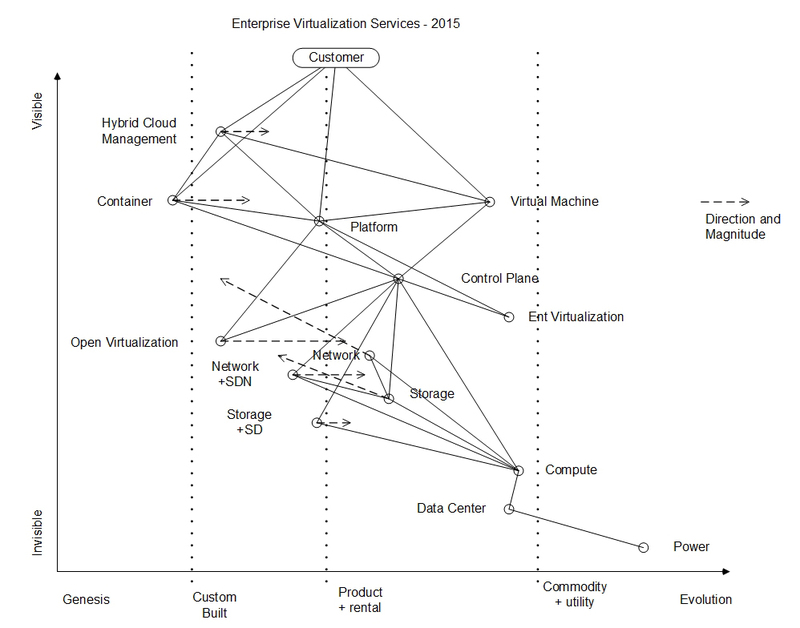 Hybrid Cloud, still a manual integration process, but it should improve, so it moves to the right a smidge. Update: I picked some tidbits from the ensuing Twitter conversation. @swardley Mapping smaller scale predictors in XaaS space. http://www.abusedbits.com/2016/01/mapping-exercise-enterprise.html … Wondering if you can have a look at this. 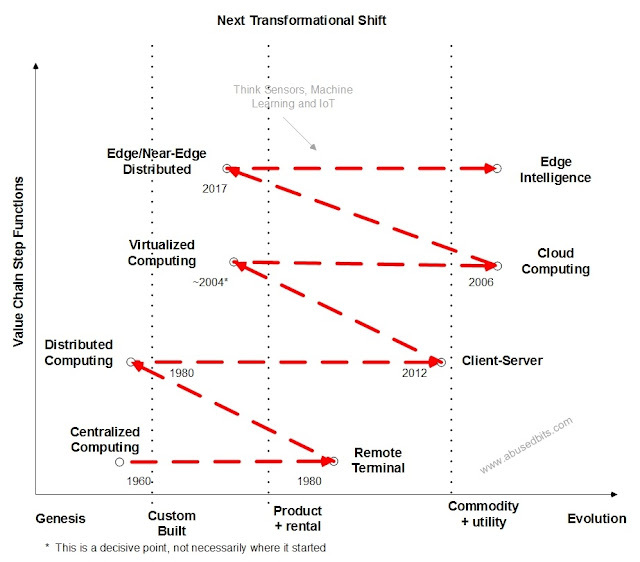 @blopeur @swardley using a perception of the previous years vectors. Ok @abusedbits, I had a look at your map. I'd counter (which is part of the point of mapping) with this. @blopeur @abusedbits : that's the point of map, people can add / delete / debate etc. 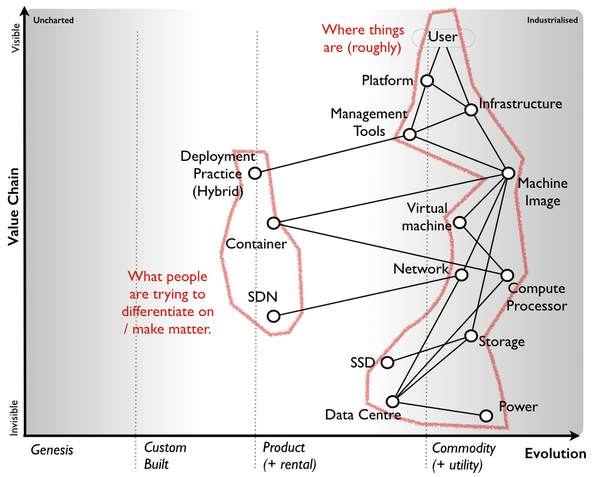 @swardley In the fast movers, makes perfect sense. Are you confident in the more conservative Enterprise space RE adoption? 2) Access to coding platform to trump concerns over if it uses VM / containers etc. ... it's a question of what is more important to user. ... provision of containers maybe a differentiator but my need is for very utility based infrastructure and this trumps. @swardley That's the real trick there, isn't it. @abusedbits : hence position relative to an anchor ... the anchor being user needs. @blopeur @swardley I was trying to create a prediction based on the map at smaller scales than WAR. @blopeur @abusedbits : find duplication and bias is a big bugbear of mine. 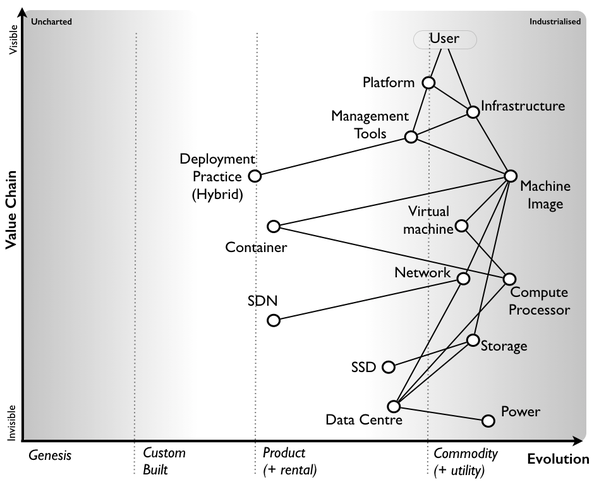 @swardley @blopeur I've seen it before, but really "saw" it for the first time in the presentation today.